Faber Group is principally involved in two main businesses, namely Integrated Facilities Management (IFM) and property development. Khazanah is currently the largest shareholder with an equity stake of 34.3% in Faber Group followed by Universal Trustee with an equity stake of 23.4%. Having the status of GLC (Government Linked Company), the company is poised to benefit from the potential consolidation of the healthcare sector, including possible M&A involving Faber Medi Serve and Pantai Medivest, both of which Khazanah is holding a substantial stake. This division is currently the largest contributor to Faber's performance, accounting more than 80% of its revenue and net profit respectively while the remaining comes from its property development division. Its IFM consists of two divisions, namely healthcare and non-healthcare. Bulk of the revenue is from healthcare division, which provides services such as central management information, facility engineering maintenance, linen and laundry service, cleansing and janitorial service, clinical waste management and biomedical engineering maintenance. It is currently servicing 79 hospitals in Northern region of Peninsula Malaysia, East Malaysia, UAE and India. The company is holding a 15-year concession to service government hospitals which will expire in 2011. Faber most likely will be able to renew the contract in view of its track record and expertise in this area coupled with the fact that it's being held by Khazanah. For 9 months ending Sept 2009, Faber has already recorded RM49mil net earnings just from this division alone. This division's net profit was RM43.5mil and RM38.3mil for FY2008 and FY2007 respectively. On top of that, it's recently awarded on 23rd Nov 2009 by Abu Dhabi government for improvement, development, upgrading and maintenance of infrastructure facilities and projects at Madinat Zayet, Abu Dhabi worth RM142.1mil p.a. with an option to extend its services by 1+1+1+1 years, which could further boost its earnings in 2010. Assuming net margins of 10% which is in line with Faber's historical margins for its IFM business, it will add RM14.2 mil to its earnings. Therefore, this division could hit more than RM70mil p.a. quite easily. 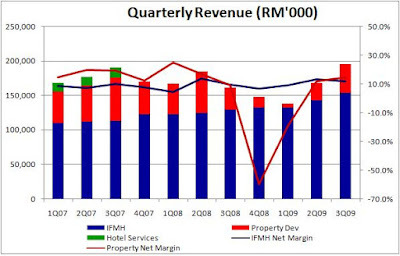 Its property division rebounded quite strongly with its revenue increasing from RM6.2mil in 1Q2009 only to RM42mil in 3Q2009. Consequently, it registered net profit of RM6.1mil and RM3mil for 3Q2009 and 2Q2009 respectively after two consecutive quarters of losses of RM1.2mil and RM9.3mil in 1Q2009 and 4Q2008 respectively, backed by its encouraging sales of its two ongoing projects, Laman Rimbunan, Kepong and Tmn Hilltop, Kota Kinabalu. Going forward, the company could be launching its exclusive residential project at Tmn Desa worth about RM170mil starting 3Q2010 which is timely as its current unbilled sales is estimated about RM90mil which could last until next year only. Currently, Faber owns about 40 acres of land worth RM700mil and is looking for new landbank via outright purchases or via JV with landowners. Attractive. 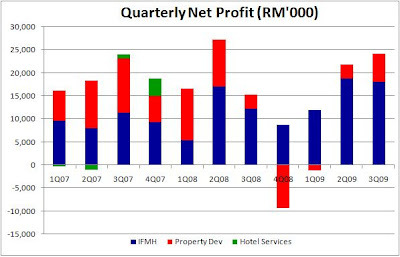 Assuming property earnings of RM15mil on the back of RM150mil revenue, in addition to RM70mil earnings from IFM, its net profit could reach RM85mil, translating into EPS of 23.4 sen. For conservative sake, by attaching 8x to PER 2010, its share price could reach RM1.87. At current price of RM1.40, it's still trading at 6x only, which is a huge discount considering its stable income from IFM business and recovering property earnings which should command higher PER. Price triggers include stronger quarterly earnings and more potential IFM awards coming from UAE or India. It has a strong balance sheet with net cash of about RM100mil @ Sept 2009, equivalent of 27.5 sen per share. Manipulative block trades are just annoying. Putting seller's queue with few thousand lots at RM1.48-RM1.51, how to move up???!! !